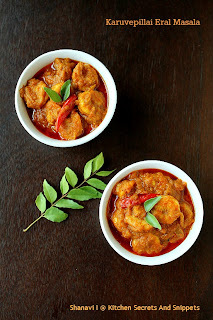 Today am gonna share one of my favourite recipe with favourite ingredient, which is Prawn/Shrimp. The list might seem long, but it is very simple to make. Trust me, there is one marination part, grinding part and as usual chopping part of onions/tomatoes. This tastes extremely delicious that sea food lovers like me, will finish it in a jiffy. I tell you, there will be only a HINT of curry leaves flavour, that no one can predict the addition of curry leaves in this recipe. U may also use coconut oil for an extraordinary taste. Slurp. 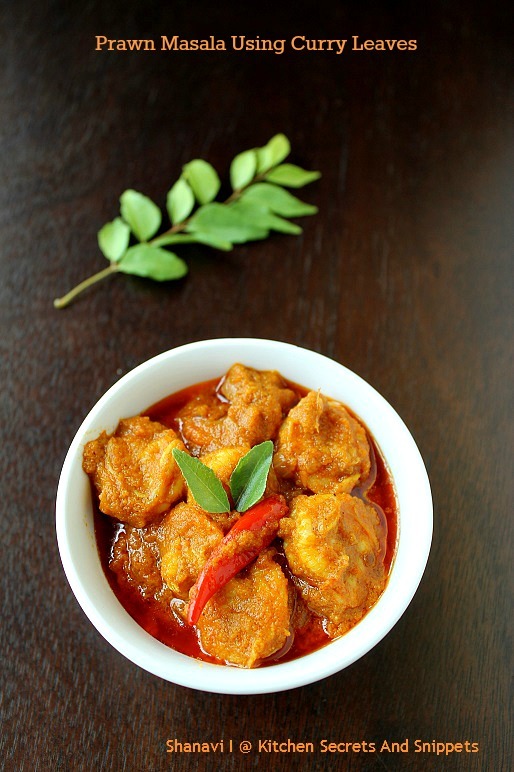 Take a look at my preparation , give this recipe a try. Fresh green/red chillies - 2 nos. Marinate the cleaned prawns with ginger garlic paste, turmeric powder, red chilli powder, fennel seed powder, salt and lemon juice. Mix well to combine and let it rest in the fridge for at least 1 hour. Dry roast the whole garam masala one by one until it gets hot to the touch and let it cool for a minute and grind it with coconut and curry leaves to a fine paste. Keep aside. Heat a kadai with 2 tsp of oil and fry the onion until it sweats and turns transparent. Add in the ginger garlic paste and fry well for another one minute. Add in the chopped tomatoes, green chillies, curry leaves, salt (remember the marinated shrimp already has some salt) and mix well wwith the masala. Cover the kadai and cook for 2 minutes on medium low flame so that the tomato breaks and gets cooked with the masala. Now add in the turmeric powder, red chilli powder, coriander powder and stir together the contents for a minute . It's time to add the ground paste , so add the ground paste to the masala and combine well. Add little water to the mixie jar to wash out the remainings of the ground paste and add to the masala. Cover and cook the contents for 2 to 3 minutes on medium low flame until it reaches the gravy consistency also the raw smell of the curry leaves fades away. Finally dump in the marinated prawns, combine well with the gravy. Do not stir often. Cook the prawns for exactly 4 to 5 minutes, by now the gravy would have released the oil on the surface and the prawns would have cooked to perfection. Throw in the coriander leaves, mix well , rest for a minute and serve the curry hot with rice/roti's. Do not add more than 2 sprigs (longer sprigs) for the quantity mentioned here, else it will be over powering of curry leaves. 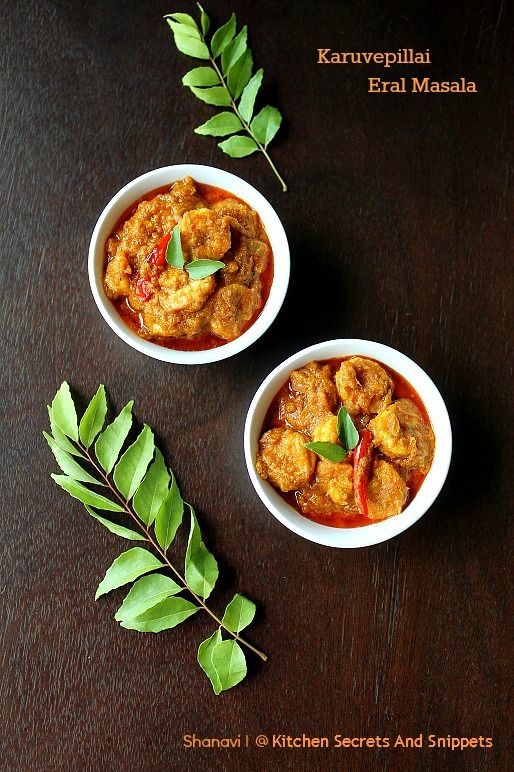 The cooking time of prawns totally depends on the size of the prawns u r using, usually bigger shrimp/prawns will take 4 to 5 minutes and the eral/small one's takes little less time to get cooked to perfection. Do not cook the prawns more than 5 minutes as it will turn rubbery. U may skip dry roasting the whole spices and add the garam masala powder instead. i do the same way.. but no marination past... this is different and i must try it one day.. bookmarked !!! i just love this with rice.. nice clicks dear.. 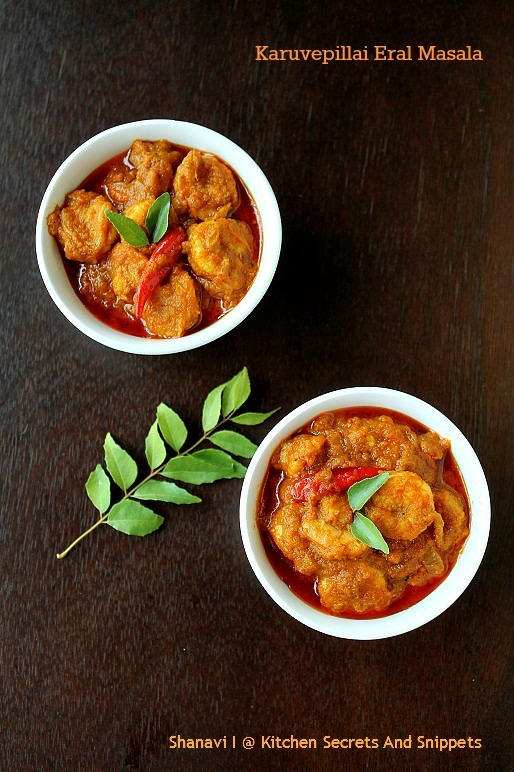 The colour of the dish itself is very pleasing and attractive,delicious prawn masala. I am making this tomorrow. This looks beyond delicious, and I am a huge seafood lover. This is truly smashing.Pinned and bookmarked.